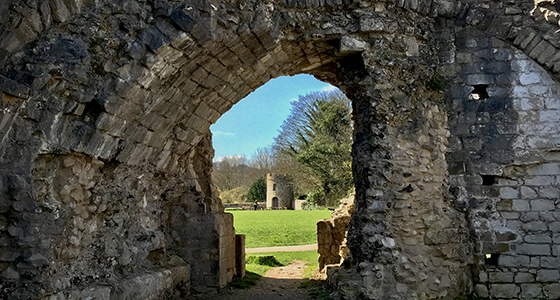 Lewes Priory was founded by William de Warenne and his wife Gundrada between 1078 and 1082 on the earlier site of a Saxon Church. The Priory belonged to the French Benedictine Order of Cluny and became one of the wealthiest monasteries in England. In 1264 it was occupied by the troops of King Henry II and after the Dissolution of the Monasteries by King Henry VIII, the site was briefly owned by Thomas Cromwell. After hundreds of years in private ownership, the monastery fell into ruin which is how you find it today. The recording conditions at the Priory could at best be described as challenging. The site is open to the public and has paths surrounding all of the major structures, this makes the certain validity of any clip as being EVP very difficult. Whilst many visit recordings are easy to review, the wind noise and possible contamination from other sources means we had to be very selective in the clips we present as EVP. Only those with unusual tone and contextual tone were isolated. EVP 1: Captured whilst Rachel was sitting on the remains of a small spiral staircase, it's a purplexing clip. The language would lead us to believe it is being spoken by a former resident whose remains are unknown and who looks to us for help. EVP 2: It doesn't matter where the group record, there are frequently voices heard speaking our names. On a site visit those listening might only hear Rachel's voice, yet in a seance all of the group will be heard. We have yet to understand why this is so. EVP 3: If films and the media were correct in their portrail of EVP as dangerous, Rachel would have been killed in a variety of ways, many times over. This is yet another example of an unseen entity wanting to do who knows what. EVP 4: Could this be another threat or a warning to someone from the past that they are in mortal danger? The truth is we will never know. It's tempting to make ourselves the target for messages such as this but with a millennia of history to draw on, the context and direction can only be narrowed by the language and dialect of the speaker. This man uses modern English, with a relatively generic Southern English accent. EVP 5: The tone of this voice rules out its source as a person on site. There's no wind noise and despite Rachel being encased in thick stone walls, the clarity is very good. The content might suggest that the speaker is able to see Rachel because of the ruined state of the building.